← Is the Saturation of CO2 Logarithmic? Amongst those who have come to realize that climate models based on radiative transfer are running too hot, there is disagreement as to whether the hot bias results from emergent complexity the radiative transfer equations have yet to include; or the irrelevance of the radiative model. Several people, including Ned Nikolov, have impressively modeled the atmospheric profiles of the earth and other planets using only atmospheric pressure and completely ignoring radiative effects. As discussed before, atmospheric pressure effect warming is called adiabatic warming. It literally means “without the devil”. For our purposes here, the “devil” may be thought of as radiation. Adiabatic warming is well known in meteorology. It includes the increased surface temperatures when atmospheric pressure is high, and the warming of “Foehn” winds as they fall from higher elevation plateaus. Such winds are the root of the disastrous fire season this year in California. Note: Gordon Dressler was kind enough to point out that the diminution of gravity begins at the center of the earth rather than the surface. Accordingly, the original graphic has been replaced by the corrected one above. 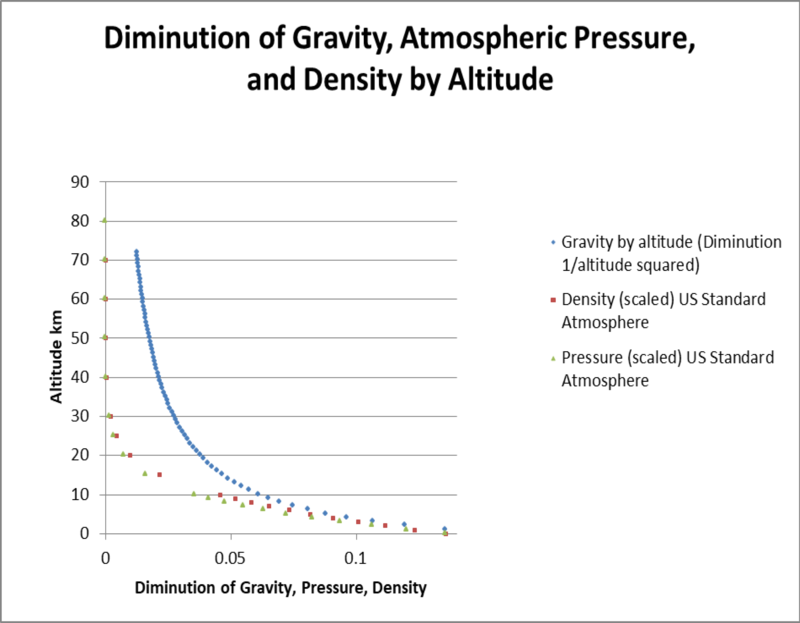 It can be seen that gravity approximates the density and pressure profiles of the atmosphere, but that there is significant divergence between about 3 and 20 kilometers above 5 kilometers altitude. This divergence is greatest at the tropopause, 11 kilometers in the US Standard Atmosphere. about 25 kilometers and converges somewhat thereafter. The entropy of the atmosphere (the number of ways the molecules can be rearranged without changing properties) correlates very well with atmospheric density, and very poorly with gravity. We conclude that gravity may well be the predominant factor in the atmospheric profile, but that other factor(s) must be in play. Very likely radiation is one of these factors. Seemingly, the devil remains ensconced in the details.